The official site to order your copy of this "destined to be a BEST SELLER" book. Make sure you eat a healthy breakfast. If you're preparing the lunch for your child --- include your child in the preparation of at least one item included in their lunch. Remember to start with clean hands, surfaces, fruits and vegetables. Be sure lunch includes foods from the ChooseMyPlate model (fruits, vegetables, grains, proteins, and dairy). Don’t over pack the bag lunch to avoid leftovers and food safety issues. It's Saturday night and I am excited. Why? Spring is on its way and tomorrow is set aside to plan the Spring garden -- commit my thoughts to paper. I love it. Always remember the first rule of gardening -- plant the right plant in the right place. Probably leaf lettuce, radishes, arugula (so easy to grow), beets and peas will be first in the ground this year. These are all easily grown from seed. Tell me about your "dirty" garden plans. 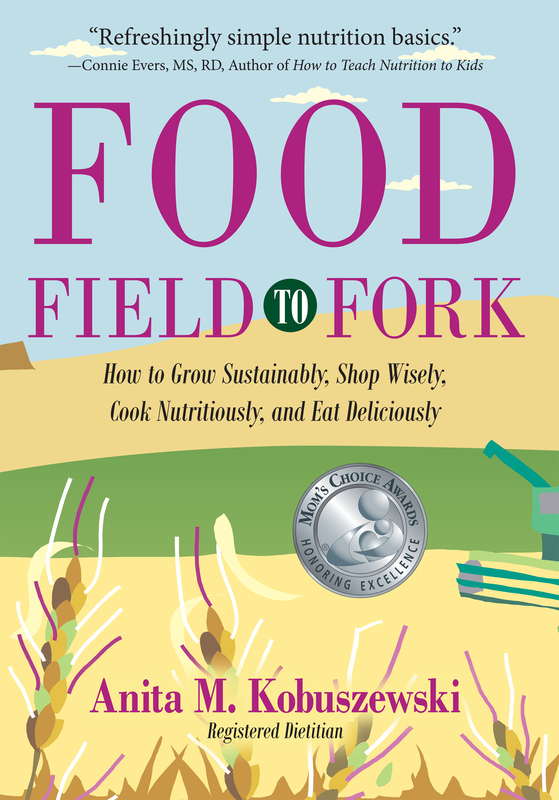 Read more about how gardening in FOOD, Field to Fork. I have a friend who came across the book called "Wheat Belly." It claims wheat produced today is different from the wheat produced decades ago. Therefore, it is not as healthy for us and it is causing both diabetes and obesity in this country. MY RESPONSE: Food basically doesn’t change too much over time but know that no food is exactly what it was nutrient-wise over time….all foods are tested for current nutrient contents by the USDA on a regular basis. Say every one or two years. Obesity and diabetes mellitus can result from eating too much but whole wheat or grains isn’t to blame for this. Many things can contribute to these developing these diseases. To say it causes these diseases is a bit simplistic and sounds like hype but is definitely an attention getter. That’s like saying grapes are the sole cause of alcoholism. Get my drift? MY RESPONSE: All food can fit in a healthy diet. Also, what is the difference between "100% whole wheat" [MY RESPONSE: made with the whole kernel of wheat] and "100% whole grain [MY RESPONSE: made with the whole kernel of whatever grain is being used in the food product] ?" Thank you for you time and I look forward to your opinion. READ: Grain Grains and Friendly Fiber chapter in FOOD, Field to Fork for more on this topic. Blog tagline: Nutriton doesn't start until the food passes the lips!